We departed Polokwane (formerly Pietersburg), South Africa by private charter. It took nearly 4 hours in the well laden Baron to reach Quelimane where we cleared Mozambique customs and immigration before continuing on 30 minutes to the private grass strip next to camp. The only access to Mahimba Camp is light aircraft or barge. 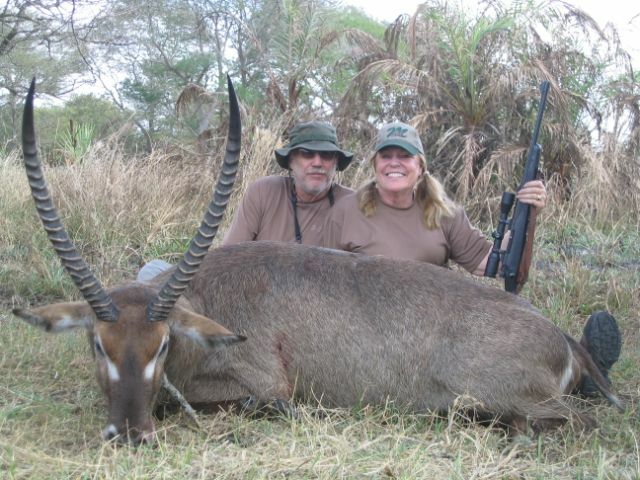 My husband and I had been invited to join another couple who had purchased the 10 day safari at the Reno, SCI auction. We considered taking this safari somewhat self-indulgent, since we already have another Tanzania safari booked by 2006. However, due to my husband’s macular degeneration and our addiction to Africa, we are in a race with the clock while he still has limited vision. 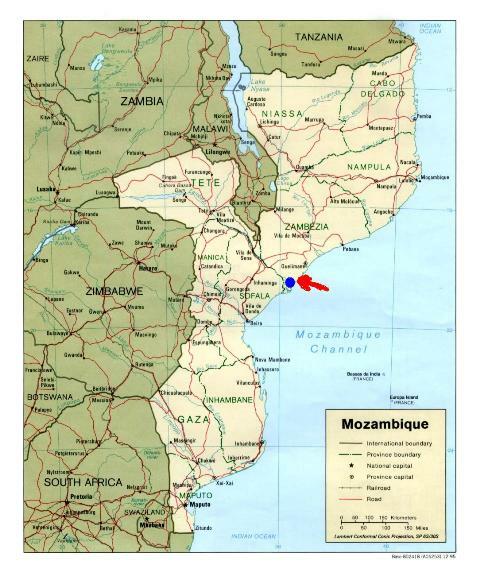 We decided to join our friends for whatever awaited us in Mozambique. We were unfamiliar with the outfitter so our expectations were open. The outfitter was McDonald Pro-Hunting and claimed to, historically, have a 100% success with both sable and buffalo. 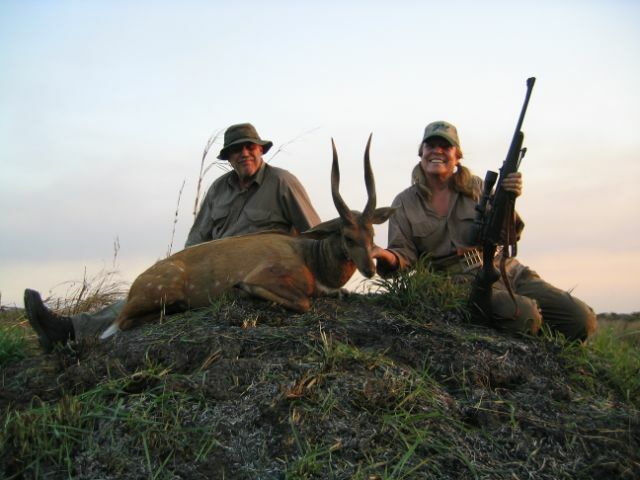 Our friends had previously hunted with their PH, Leon Lamprecht, in South Africa. Our PH was Dominque Maarten. The incentive for me was primarily sable, which had eluded me until now. The camp was the tidy remnant of an old coconut plantation. 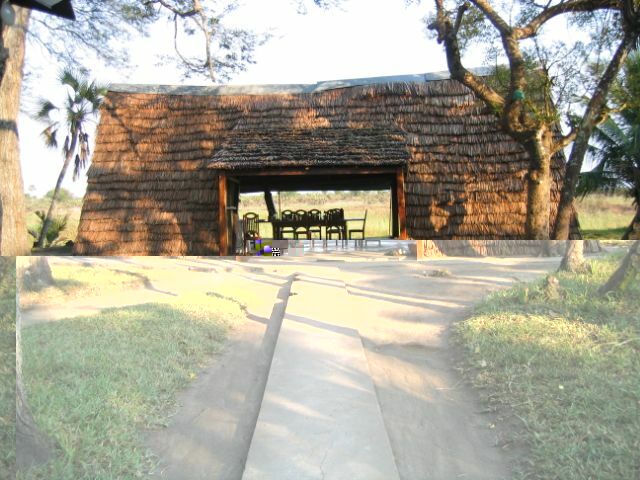 Our quarters were thatched A-frames which were called chalets!???? The dining hut was a larger version as well as the kitchen hut. We had running water, albeit very red and rusty; clean but basic accommodations. We slept using mosquito netting, due to the swampy conditions of the concession and being so near the Indian Ocean. The camp itself was not of the quality we have enjoyed, for instance, in Botswana or Tanzania tent camps, but the food and staff were on equal par to anything we had previously experienced. And when comparing the barest African camp to the minimalism of an Alaskan spike camp, it was just fine. The only real surprise we encountered was the extent of poaching we ran into while hunting. Everyday we found snares and snared animals (which we cut lose). Mozambique does not finance an anti-poaching patrol and locals apparently snare animals as a source of income from free meat. There was a great deal of waste in this method as well as a rapidly declining game population in the concession. 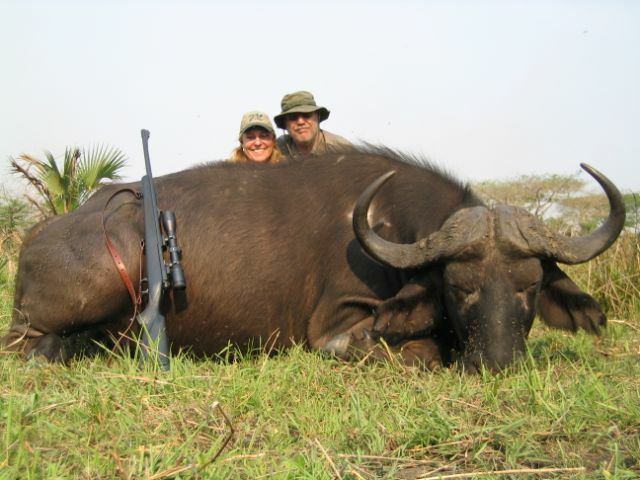 Our hunting plan was for me to hunt sable and to find a lone buffalo bull for my husband. We knew he wouldn’t be able to distinguish a bull within a herd for proper target ID. We had 10 days and were willing to wait until the last few days before re-assigning the buffalo to me. So we set out the first day looking for buffalo sign. We passed plentiful bushbuck, reedbuck, waterbuck, and warthog. The second day we got on a herd of 80-100 buffalo, but no lone bulls. 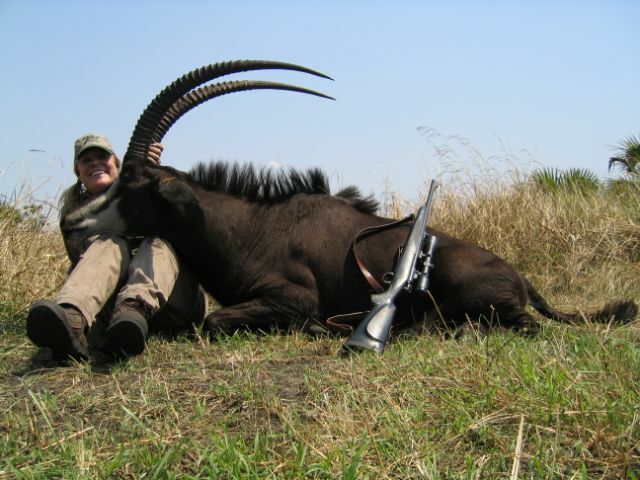 On day 4 we stalked a herd of sable and had a great vantage point at about 70 yards and played the wind properly for over an hour, only to have the herd take off before offering me a shot at the bull. Day 5 while glassing another herd of sable at about 300 yards, a bull sable and his single cow popped out of a palm thicket about 30 yards in front me. It was an easy shot and I finally had my sable. He wasn’t a monster like those found elsewhere in Africa, but he was a beautiful trophy to me!!! Again, I was using a 300 gr Trophy Bonded Bear Claw. We spent the next two days trailing a buffalo herd. Many times we crawled as close as 30 yards; but no lone bull or a bull a part from the herd. After we put the herd to bed on the 6th night, we picked it up the next morning and trailed it until 2:00 PM. At that point our PH suggested we weren’t going to get a better scenario than an old bull in the herd at 70 yards. My husband put me out of my misery (hands full of thorns from crawling, knees black and blue, removal of ticks) and deferred the buff to me. My first shot was with a soft point, which broke the bulls shoulder well. After the herd thundered off in a cloud of dust, he stood about 50 yards away. I put a Trophy Bonded Sledgehammer solid into him. He went down and I paid the classic “insurance” with another solid. I’ve taken 5 cape buffalo prior to this one and they were all larger trophies, but together my husband and I worked for this old guy. My husband did everything with me but pull the trigger. And, I consider him a saint for allowing me to shoot HIS buffalo. I guess this is why we have been married for 37 years!!!! 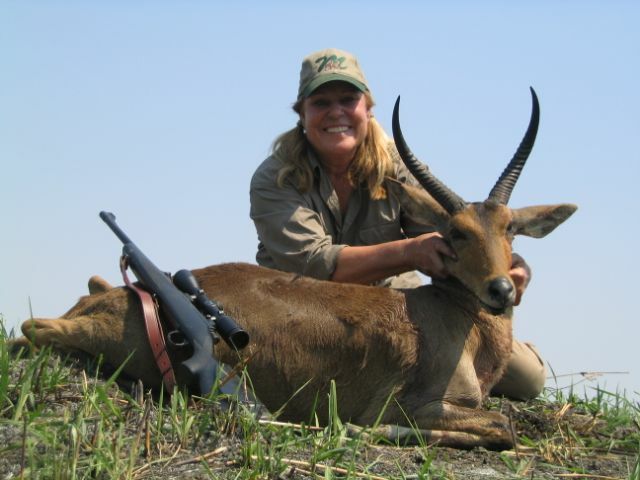 In the remaining days I picked up a representative reedbuck and waterbuck. During our safari I celebrated my 59th birthday and my husband celebrated his 66th a few days later. Getting older isn’t so bad!!!!! Next year we’ll celebrate my 60th his 67th in Tanzania after elephant!